The Colosseum in Rome 2019: Tickets, entrance fees and opening hours. 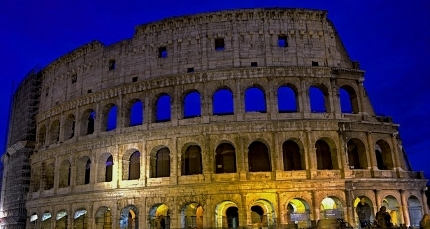 This article is intended for tourists wishing to visit the Colosseum in Rome. It informs about tickets, opening hours, how to get there by subway and much more. No other object symbolizes the fame and technical abilities of ancient Rome more than the Colosseum. The arena in the heart of Rome is the largest building ever built by the Romans. It covers an area of about 190 x 155 meters. You have to walk more than half a kilometre to circumnavigate the gigantic ancient stadium for 50,000 spectators. The height of the stadium, completed in 80 AD, is almost 50 metres. The Colosseum is with the Vatican the most popular sight in Rome and the landmark of the capital of Italy. Very often there are long queues and waiting times at the entrance. Every day the gigantic number of 19,000 visitors comes to the Colosseum (average, in summer much more, per year about 7 million visitors). Thus, the Colosseum is the most visited sight in Rome, which costs admission. According to Internet statistics, „only“ 5.7 million people visit the Vatican Museum every year. Tip: Good guided tour in the Colosseum including admission ticket can be booked online without queuing. In the Colosseum there were very cruel fighting games between humans and with animals. Not infrequently the participants of the fights died. The fighters (gladiators) were usually slaves and were forced to perform in the arena Colosseum. The bloody events in antiquity served to entertain the citizens of Rome. The entrance to the fights was free for the citizens of Rome. The building in the style of an amphitheatre was built between 72 and 80 AD and was in operation for about 450 years. Up to one million fighters are said to have died in the fighting games over the many years. The Colosseum is a stadium without a roof. Its size can compete with that of a modern football station. About 50,000 spectators had seats in the ancient Colosseum. The building has been preserved to a large extent, but by no means completely. In antiquity, large bronze signs were attached to the outside. In addition, the Colosseum was decorated with huge bronze statues. They depicted heroes and gods of ancient Rome. Presumably there were over 150 statues, in each arch stood a figure. Among the animals that had to take part in the bloody spectacle were tigers, lions, leopards, crocodiles, bears and even elephants. Bringing these wild animals to Rome was very costly. Some species were almost exterminated. In addition, the Colosseum was sometimes filled with water. Sea battles were recreated with ships. In the largest amphitheatre of the world there were public executions. In the cellar of the colloseum there were many corridors, pull-outs and pulleys with which the gladiators and predators were lifted into the arena. The floor of the arena was made of wood and covered with sand. So the blood could be removed quickly. We went for the last time in January 2018 on a Thursday to the Colosseo (Italian name of the ancient venue). Although in January there are many times less tourists than in summer in Rome, we had to wait about an hour to see the antique amphitheatre from the inside. We had to queue twice. First at the security controls (luggage and body are scanned like at the airport) and then at the ticket counter. The crowds and the controls reminded me in a way of a big football game. Outside the Colosseum and on the roads there are many people on the road selling tickets. Some of them talked also to us. A young Briton, who seems to work for one of the ticket agencies, wanted to sell us a guided tour for 74 Euro per person. When we refused, he offered us a „special price“ of 55 euros. „This price is only for you“ etc. Later we found out that the offered tour would have taken place several hours later. Of course we didn’t buy a ticket for the Colosseum on the street. What is true, however, is that holders of tickets from the Internet do not have to queue. The security check at an extra entrance is much faster. Of course, visitors to the Colosseum who already have an admission ticket do not have to wait at the queue to buy tickets. But the tickets on the internet are a bit more expensive. The whole thing is called „skip the line ticket“. If you pay a bit more in advance on the Internet, you don’t have to queue. In Rome there is something like this also in the Vatican Museum, also in London, there are „skip the line tickets“ in some big sights. „Skip the Line“: You pay a bit more, but you have to queue for hours. There are also tours on the Internet that offer more than just entry to the Colosseum. On some, of tours not so cheap tours, you can also visit the underground facilities. Under the Colosseum were the prisons of the gladiators and the cages of the animals. Those who have the money can even rent a private guide through the Colosseum. There are tours in many languages, of course also in English. Many different tours are offered on the Internet, which differ extremely in quality and price. It is also not always easy to find a guided tour in English. You should make sure that an entrance ticket with quick admission (without queuing) is already included. 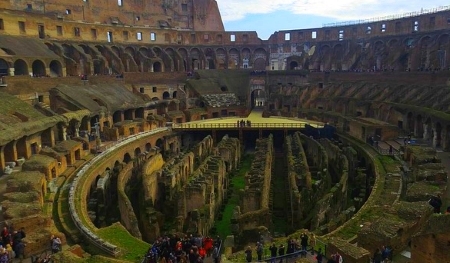 A guided tour through ancient buildings like the Colosseum is very interesting. As a normal human being you hardly recognizes and understands most things and see mainly ruins and stones. The explanation of a competent guide makes the Colosseum really interesting. As a normal visitor, you can only go on one level, for example on the first floor of the Colosseum of Rome. From there, you have a good view to the interior of the largest building in ancient Rome. Almost every visitor takes many photos. Many tourists upload the photos and selfies via mobile phone directly to Facebook etc. The 3G and 4G networks are fast in Rome. But you should consider the costs (data roaming). Most visitors stay only about half an hour. All tickets for the Colosseum are also valid for the Roman Forum and the Palatine, the common entrance to these two interesting sights is only about 500 metres from the Colosseum. There is a lot to see and long walks, you should plan several hours. Drinking water is free at Colosseo in a faucet. In a shop inside the Colosseum you can buy chilled water (0.5 litre bottle) for 1.30 Euro (in 2018). Books on the subject are sold here. Also T-shirts with the imprint of the Colosseum, souvenirs about Rome etc.. In the Colosseum there is a toilet which was not really clean during our visit. Carriage rides are offered in front of the Colosseum. I asked for the price: 150 Euro for about one hour and a maximum of 4 persons. We didn’t make use of all the offers and spent exactly 12 Euro each at the Colosseo for the entrance fee. Therefore we queued for more than one hour. But it was January. In summer, the waiting time should be a lot longer if you do not buy a ticket in advance on the internet..
You can visit the ancient stadium in Rome every day from 8:30. The only exceptions are the New Year, May 1st and Christmas. Depending on the time of year and the onset of darkness, the entrance closes at different times. In summer (until the end of August) you can enter the Colosseum until 18:15, in winter only until 15:30. The exit closes one hour later. The normal entrance fee for adults is 12 Euro. Children under 18 years (!) do not have to pay anything. These are the normal prices at the beginning of 2019 with often very long queues. „Skip-the-line-tickets“ (see yellow box) from the internet are a bit more expensive, but make sense. You don’t have to waste large parts of a valuable holiday in a queue. The Colosseum has its own underground station and is therefore easy to reach. It is located on line B, only 2 stations south of Termini Central Train Station. You can also from the station in about 20 minutes. The Colosseo is about one kilometer south of today’s city center of Rome (Spanish Steps or Pantheon). The Colosseum became even more famous by the movie „Gladiator“ (Hollywood) directed by Ridley Scott. It was one of the most important feature films in 2000. The main Russell Crowe (role Maximus), Joaquin Phoenix (role Commodus) and Connie Nielsen from Denmark as Lucilla.